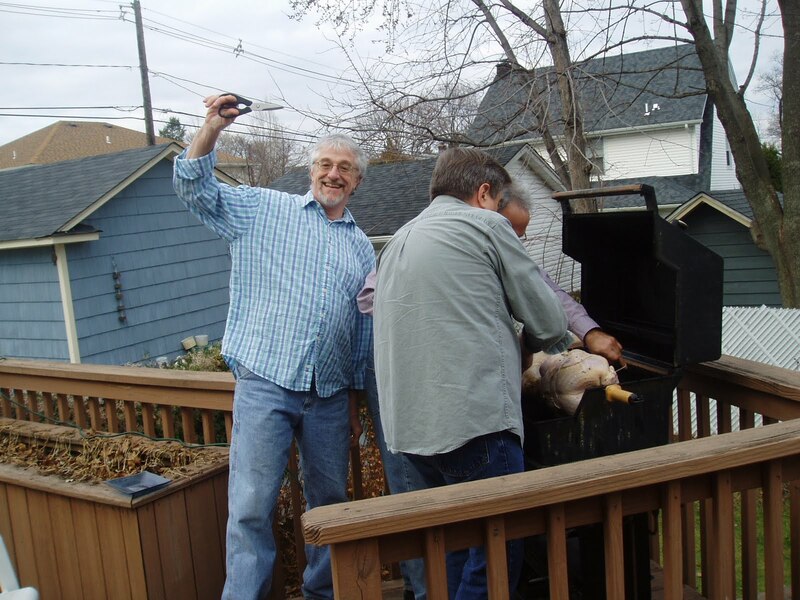 Day of Thankfulness and not so Traditional Cooking! Thanksgiving is almost here and I have to still run around and get a few more items to complete my shopping list. It never seems like there is enough time probably due to my little habit of time mismanagement! We are having a smaller crowd than usual this year which required only one 15 pound turkey. 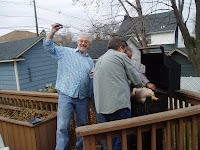 Last year we had two turkeys and my husband and his friends Vinnie and Lenny thought it would work out better if we roasted them on the gas grill outdoors using the rotisserie. Some how they manage to tie up both turkeys at the stake which weighed in at 30 plus pounds! It certainly would have made any boy scout proud they way they wrapped and knotted the unsuspecting poultry to it's spike-let! I had my doubts but was doubly assured this would work fine! 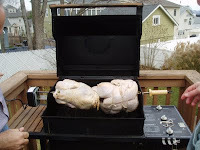 As the big birds struggled to make their rotation over the grill I watched skeptically from inside with my Dad. A few minutes had passed when my father calmly stated " I think you have a fire out there!" Well sure enough flames where shooting out of the bottom of the Weber! "Fire in the hole!" I shouted! The men sprung to action! Extinguishing the fire they examined the charred turkeys. They had admitted ( a difficult thing for men to do! ) that the weight was too much and they skin was the accelerator in this case. They removed the birds and salvaged what they could. One was refurbished to go back on the rotisserie and since the oven was busy with other dishes of the day there was a back up plan for turkey number two. Vinnie had brought with him one of those Ronco Rotisseries. You know the ones that use to be on the infomercials hawked by Ron Popeil. They work pretty well for what they are. However they are made to accommodate a large chicken at best. In order to get this unwilling bird in there the legs and wings had to be amputated. Ouch what a sight! " Oh well" I thought "they are always enough sweet potatoes and green bean casserole to fill folks up with!" With a little faith and holiday magic the two turkeys were cooked ( maybe not to perfection! ) and were on the table with the rest of the goodies. I could swear I could taste something like charred skin but I ate it with a smile! Hopefully this year will be less eventful though we have Ozzie now so no telling how dog versus turkey will turn out! Happy Thanksgiving to you all! 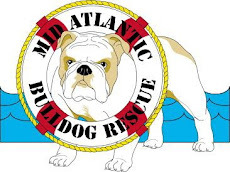 Uga Vll goes to the Dog House in the Sky! It was in the news yesterday that Uga Vll passed away unexpectedly! Uga is the famed white bulldog, University of Georgia mascot. He was only four years old! His owner Frank "Sonny" Seiler said " Uga woke up Thursday morning and did not seem to be feeling well." They have an on call veterinarian who immediately came to the home and took Uga to the veterinary hospital but alas too late! It is believed he died from congestive heart failure. 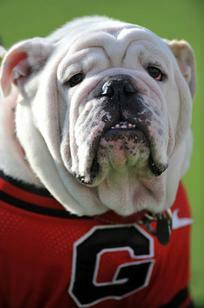 Uga has been the mascot since he had to fill the shoes of his father in August 2008. He was the school's winningest mascot with a 87 - 27 record. 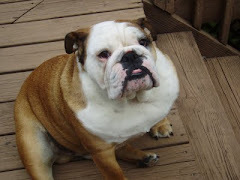 He was a dignified and well behaved bullie that roamed the sidelines with his little "G" jersey. A replacement has not been announced yet and a wreath will be laid on Uga's doghouse in the stadium. Ozzie has not yet applied for the job but since he is red and white that would probably exclude from consideration. Besides Ozzie is a Rutgers fan anyway! I am sure that Uga was much more than a mascot. He was a beloved pet and he will surely be missed! 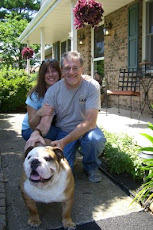 I came across online this morning an English Bulldog named Deezel that is just amazing, at least by bulldog standards! He participates in agility testing and freestyle dance competitions! I can't even get Ozzie to walk to the corner just to relieve himself on the fire hydrant. Bulldogs just don't do competitions like that! He must have a gene from a Lab or Collie in him! I wouldn't want to make Ozzie feel bad about himself but the likely hood of him doing any of these stunts, well you have a better chance at seeing me run in the NYC marathon next year! Now if they had canine competition for snoozing on the couch or the most prolific pooper then Ozzie may have a chance of wining! Sorry ole dog you will never be a contender like Deezel but you will always be in a champion in this household! What a beautiful weekend here in NJ we had! On Saturday we met a group of good friends in the city to stroll around the Village and have dinner at a Argentinian steakhouse. It was an all day event and since our son was not going to be home at all we had to arrange for our neighbors, Al and Clare to doggy sit Ozzie! Now they really like Oz and have watched him once before when we went to a wedding! I felt a little guilty about asking then to sit again but my husband assured me that they don't mind and would be happy to do it! So around 2:00 in the afternoon we brought him over with all his doggy paraphernalia. We thanked them profusely and made a quick exit while Ozzie was distracted! The plan was for then to have him until around 9:00 PM when they would drop him off home and we would arrive shortly after! Well we got home and everything seemed to go as planned. Ozzie was waiting for us shaking his little rear in bulldog glee! There was a little pee pee on our oriental rug but we have now resigned that this happens when we go out. ( Time to buy wee wee pads! ) I went out on Sunday and wanted to get them something to show our appreciation. I got them a gift card to the local Chilli's figuring going out for a bite to eat is always enjoyable. I went over there with thank-you card in hand and rang the bell. Clare answered and I asked her how it went for them yesterday. She replied that Ozzie may have worn out his welcome! "oh no" I gasped, "Did he pee on your floor?" " No worst!" she said " he pooped in my dining room!" They ran out for a short moment to her daughter's house. They wanted to bring their granddaughters over to play with Ozzie. I bet that was a nice surprise to come home to! I apologized profusely for the mess my dog made as I handed the card to them. " You didn't have to do that" said Clare. 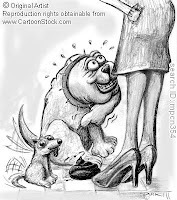 Oh yes I did, especially now that I know my dog relieved himself of number 2 on your carpet! I walked home my head hung in shame! When I got in the house I shouted to my husband " Guess what your dog did! " "Yikes he did not!" was his reply after he heard the ugly news! "Yes and now we will either never leave him alone for more than a hour or have to find new doggy sitters that don't mind the occasional dog doo disaster! In all this Ozzie laid on the floor, head tucked in between his paws trying not to look at either one of us! Ozzie has to know this is not a way to influence people or make friends. Maybe in the dog world this is an acceptable practice and maybe a compliment of sorts. In the human world this just doesn't fly! Oh Ozzie why do you do the things you doo-doo! Last night was a struggle for my olfactory senses! Given the fact that Ozzie was tooting up a storm while he slept! I know that Bulldogs are infamous for their flatulent abilities. Ozzie was always the occasional tooter. Letting one out at the most inappropriate moments! Saturday night was like a symphony of sorts! I think my husband was giving the Oz some competition as well! I thought for sure they would find me asphyxiated in my bed the next morning! 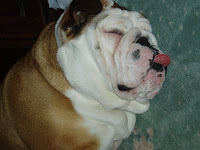 You have to really love the bulldog, between the gas and the snoring at night. It makes him a challenging dog to own! Though Bulldog fans would not have it any other way. They are so charming and appealing you can forgive them for a whole slew of sins! Well excuse me now while I go open some windows and air the place out! Cleaning the canvas sort of speak for Ozzie's next work of fart! Monday morning finds me reeling from my weekend sugar high. Just like a methadone program for heroine addicts I am stepping down and eating only one bag of Raisinets for breakfast! Halloween was fun with unseasonably warm temperatures near 70 degrees! Ozzie had a blast giving out candy to the kiddies! He was dressed up as a pirate, we called him Captain Le Woof! The pirate hat lasted about 5 seconds, definitely too small for his big head! Though he finally surrendered to wearing the cape which made him look very dashing! Parents delighted at taking pictures of the Oz with their kids! ( maybe I should charge them next year..hmmmm?! ) I think on Sunday Ozzie was wondering were all the kids went as paced back and forth by the front door?! My husband didn't really dress up but insisted on wearing his pumpkin beret! He looked like a homeless man with a pumpkin on his head. Good look dear! Though I must say if we were giving out prizes for best family costume it has to go to my son Will. He purchased a Wolf-man makeup kit from a local year round costume store called "Fun Ghouls". He was down in his room for 2 hours applying the makeup. When he came upstairs I gasped! I barely recognize him! It was Lon Chaney Jr reincarnate! Ozzie thought Will was his long lost brother! Any how on to the next holiday. That would be Thanksgiving but it seems the stores have forgotten about it totally and have fast forwarded to Christmas! I don't even want to think about Christmas shopping yet but if I was smart I would! Well for now let me think about what to do with all this leftover candy first. I should insist that my husband take it in to his office for all his co-workers (maybe except for the Raisinets! ) Well let me continue to think about it!